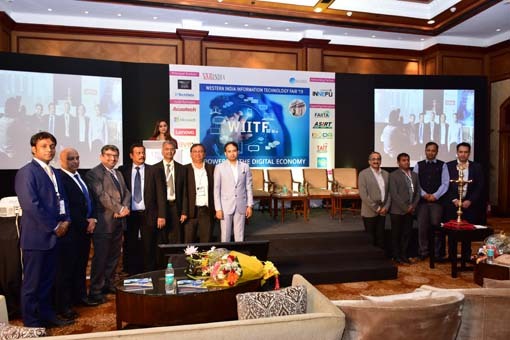 The newest emerging IT hub in the country, Kolkata has recently witnessed the 5th Eastern India Information Technology Fair (EIITF) 2014 amidst the presence of a huge gathering of CEOs, CXOs from corporate world, VARs & SMEs and government dignitaries from the ICT sector. A total of 200 + guests attended the event which was titled ‘Marketing Tools for VARS to Empower SMB’. Unveiling several initiatives, speakers from various verticals of government, PSUs, industry bodies and industrialists also participated in the function. The Chief Guest for the evening was Col. A.K. Nath (Retd. ), Executive Director, CDAC, Govt. of India. The event commenced with the ceremonial lamp lighting under the aegis of the Honorable Chief Guest and other distinguished guests - Col. HPS Bawa, CEO- WTL; Col. A.K. Nath (Retd. ), Executive Director- Center for Development of Advanced Computing; Shri. Manjit Nayak, Addl. Director, STPI, Government of India; Shri. B Hari, President- CIITA; Shri. Ganesh Chakraborty, DGM- RAILTEL Corporation of India Ltd.; Shri. V.K. Bhandari, Chairman- Supertron Electronics Ltd.; Shri. K L Lalani, Chairman- Lalani Infotech Ltd; Shri. Sanjay Pradhan - MD, Max Secure and Mr. Deepak Kumar Sahu, CMD & Publisher - VARINDIA. While addressing the audience, Mr. Deepak Kumar Sahu, Chief Editor - VARINDIA stressed on how digitization is a continuous process and organizations are heavily dependent on cyber technology today. "With geographic boundaries being collapsed in this digital era, organizations are facing threats from the virtual world. Crimes perpetrated by cyber criminals who leverage on evolved eco systems like the Dark Net. Businesses are increasingly facing impacts not only on the financial front but also irreversible damage to their brands and market reputations. As a result of this growing threat, there is a significant need for corporates to recognize cyber threats and craft cyber response plans." 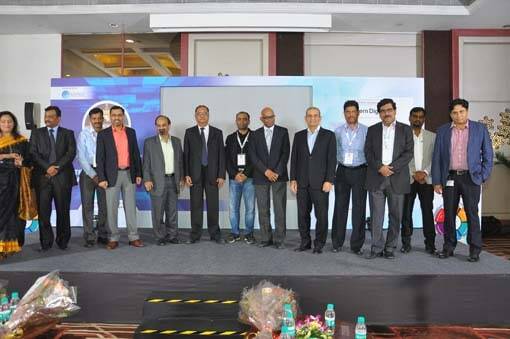 Thereafter many eminent speakers took to the stage to address the audience on key issues pertaining to the industry and the Channel community as a whole. The Chief Guest, Col. A.K. Nath (Retd. ),Executive Director, CDAC, Govt. of India spoke on the innovations by CDAC that pave the way for the potential for SMEs to further penetrate into the market in the country. "This will be an apt opportunity to sensitize the disclosures of the technology that CDAC Kolkata has developed. And we would like them to be penetrated in the society, in the masses through SMEs. We have lots of products which have gained lot of recognition; our C-DAC PARAM Yuva – II is the fastest super computer in India and also been rated as the 44th most Green computer in the world. From super computer, we moved on to language technology and many more." Col. HPS Bawa, CEO- WTL gave a brief introduction to the audience about WEBEL and also WTL, the company that he manages, "West Bengal is a state where opportunity still exists. Seeing this potential, WEBEL has built IT parks in Siliguri, Durgapur and these are some of the upcoming markets after Kolkata where you will find adequate talent. The state has also got an incentive policy on the WEBEL website and there are various opportunities that SMEs can make use of. WTL does a lot of business for WB Govt. and there are a number of projects that we are involved with." Among the corporate presentations, Fortinet, Canon, SAP and NNR IT Solutions took turns to speak on their solutions and the current market situation. Mr. Navin Mehra, Regional Manager, West, Central and East India - FORTINET Inc. presented his views on opportunities for Channel Partners ahead with Fortinet. Mr. Sachin Chauhan, Marketing Manager, OIS- CANON India gave the perspective of CANON on contribution of Channel Partners in bringing success to the emerging system Integration business in Eastern India. Mr. Jagannath Pattnaik, CEO, NNR IT Solutions, Global Distributor for Max Secure introduced his company in his presentation while also emphasizing on how essential security is for enterprises and govt. today. Mr. Kapil Mukherjee,Territory (East) Head SME, SAP India spoke about the opportunities for SMEs in eastern India and how these opportunities can be leveraged to streamline further their growth. The Panel discussion towards the end of the event was on the topic - 'Marketing Tools for VARS to Empower SMB’ and was moderated by Mr. Deepak Kumar Sahu, CMD & Publisher - VARINDIA. The panelists on the dais from various cross-sections of the industry were Shri. Manjit Nayak- Jt. Director- Officer-in-charge-STPI (Kolkata); Col. HPS Bawa, CEO- WTL; Mr. Kapil Mukherjee, Territory (East) Head SME, SAP India; Shri. Sachin Chauhan, Marketing manager- Canon India Pvt. Ltd and Shri. Sanjay Pradhan – MD, Max Secure. The discussion concluded that the use of Innovations in technology continues to have massive effects on business and society. It is a fact that technology acts as an enabler that can pave the way for being competitive. Small and medium businesses across all verticals can play a critical role in the resurgence of the Indian economy though they continue to face tough challenges in the volatile business environment and global competition. Businesses and governments must think deeply about the opportunities and risks presented by evolving trends. 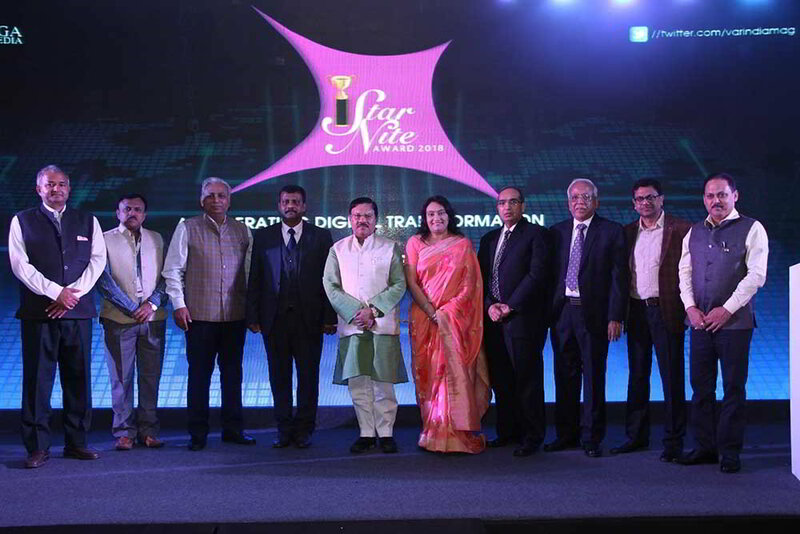 The event also took the opportunity to felicitate the Channel community from the East in different categories. Supreme Technologies Pvt. Ltd. The resellers, Distributors and System Integrators recognized were Lalani Infotech Ltd., Caltron Group, Savera Marketing Agency, Techniche Consulting Services, Suntronic Infotech Pvt. Ltd. and Supertron Electronics Pvt. Ltd. There was also a lucky draw announced where six lucky winners walked away with 2 Canon scanners and 4 Max Security Anti-virus software with lifetime validity. Best Retailer, Eastern India Supreme Technologies Pvt. Ltd. Best Reseller, Eastern India Lalani Infotech Ltd. Best VAR, Eastern India Caltron Group Best Value Added Distributor, Eastern India Savera Marketing Agency Best Network Integrator, Eastern India Techniche Consulting Services Best System Integrator, Eastern India Suntronic Infotech Pvt. Ltd. Best National Distributor, Eastern India Supertron Electronics Pvt. Ltd.